The day after WPPI when everyone was supposed to be heading off home and getting back to the real world, a lot of photographers found themselves stuck in Las Vegas due to storms knocking out travel to the east coast. One of those travelers happened to be my good friend Clay Cook! So after an intense and epic meal of Korean BBQ, we started planning out a fashion shoot somewhere in the desert. Scanning the internet for inspiration and clothing ideas we pieced the concept together and then started making phone calls! Pretty quickly we had our model and Make-Up lined up, all we needed was a ride and our wardrobe! The next morning we met for breakfast and started to figure out where we were going to get the missing pieces of our wardrobe. That's about where our friends Enrique and Mykii come in! Taylor, (our model), had some of the pieces, but we were missing some elements to our edgy wardrobe that Clay had wanted. So Enrique and Mykii picked us up and we headed to Burlington Coat Factory to hunt for a proper trench coat and accessories! We went through pretty much everything they had on their shelves, but within 30 minutes, we had made our selections, and were on the road to the desert to start shooting! 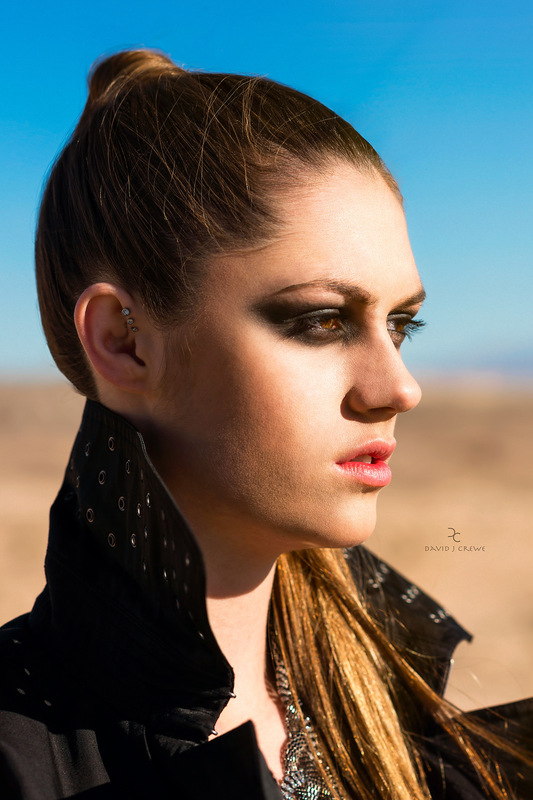 The weather was a complete contrast to the last shoot in Las Vegas with Nanako. The sun was beaming and there was just enough of a breeze to keep us from getting too hot. Basically, it was perfect! With that in mind, we made the call to go with just available light. The sun was in the perfect position to give us a great look and perfect shadows to match the style of the shoot! Two things I realized after this crazy week in Las Vegas...(1) Korean BBQ is the absolute best place to brainstorm! And (2) There is no limit to the creative possibilities on the West Coast! With a SUPER SMALL budget and a timespan of less than 1/2 a day each, we were able to pull together a couple of incredible photoshoots and had an absolute blast while doing so. I can't wait to see the images I can create when I get back to the west coast for a project with an actual budget and time to prep!